Moloy and Anita have a strong desire to see poor children given a chance for a decent education despite the pressures they face within their families, the education system and the community. When they came to this area and started moving around, Moloy realised that ministry to children was key to building relationships with families. He started running a Saturday programme for children. As this went along, he discovered that many of the children did not know much and were doing very poorly at school. Even secondary school children did not know the alphabet. He felt that helping the children was important. The position of a teacher gains a great deal of respect in the community so this would also give him the opportunity to engage the parents and open many doors. His passion is for the gospel and the lives of the children and their parents. The tutoring began in a bamboo shelter with one teacher. About two years ago people helped him to build a better building. Now there are about 45 children coming regularly each day from 7.30 to 9.30am for tutoring. They then go home and off to school at 11 am. The programme runs five days a week. Two teachers are employed and Moloy teaches as well. On Sundays about 85-90 children come to Children's Club. They run a VBS once a year and generally about 180 children come for the week in two age groups, up to 12 and then over 12. There are also special programmes at Christmas and other times. Moloy and Anita shifted to this area at the end of 2006 soon after their wedding. They have been here for 10 years now and there is a church of about 25 adults, all of them are first generation believers. This means a lot of his work is discipling these people. When they become believers, especially young people, they are rejected by their families so Molay and Anita have to be involved in the courtship, marriage, birth and everything. BHW's Field Director met Moloy in October 2015 when he was staying at BBTI, Jamtara. Moloy was lecturing there and talked to him about the work he was doing and some of the pressures of sustaining ministry. A dialogue continued and BHW's Field Director visited him for three days in July 2016 and stayed in his home. It was following this visit that a decision was made to commence partnering with Moloy and Anita. The beneficiaries here are the children who are tutored who are able to improve at school, and their families. Many of the parents leave home early in the morning to go to work leaving the children to take themselves to school. Often they just don't go. Without education these children will be condemned to lives of drudgery and low pay. Education is the key to these families flourishing. Moloy and Anita are lovely people with a heart to serve the children in the community in the best way they know how. Moloy is gentle and compassionate. He understands his vision well and gets right down alongside the children. This is reaching pretty disadvantaged children. It is a Hindu community. The parents are poor and strive hard but barely survive. This places them and their families under severe pressure. They have little education and little awareness about what education could do for them and their families. This programme maximises existing education that is going on in the schools although unfortunately the local school is a total disaster and the facilities are appalling. It is no wonder the children do not learn anything and leave illiterate. This partnership also supports a great initiative in a pagan community and takes some financial pressure off a wonderful family. Moloy Kanti Das was brought up in a brethren assembly in Asansol inland from Kolkata. He became a believer in 1994 at 15 years of age. After finishing school, he went to BBTI (Bengal Bible Training Institute) and then to Chennai - Steward Bible College doing a Diploma of Theology. Subsequent to this he did a M.Div by distance learning from Madras Theological Seminary. At the age of 21 he went to Kolkata to be involved in ministry. He lived in Bethesda Gospel Hall for six years, finishing in 2006, and undertook street evangelism, door to door evangelism and other programmes. In November 2006 he married Anita. She is from a Baptist background and they met at a Bible study in the area. 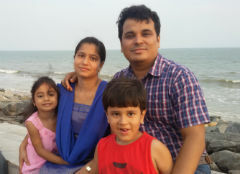 They now have two children, Stephen who was born in 2008 and Ananya (Sumi) who was born in 2013. There are no other leaders yet apart from two school teachers who are employed. 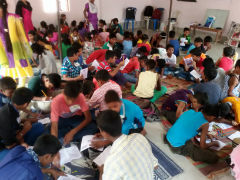 They want to see families growing spiritually and many of these children escaping poverty because they are better educated than their parents. They want to see these young people given a chance. In addition to providing the extra daily tutoring, the families are also cared for. They are visited from time to time and if a child misses class they visit the families and encourage them. If the children are sick they sometimes help with medical expenses. If the children do not go to school because the parents cannot afford it, they assist with supplies or even visit the school to help with admission and advocacy. The annual budget is US$3,300. This consists of US$1,320 for personal assistance for Moloy and Anita and US$1,980 for the tutoring programme (teacher's salaries, snacks, notebooks etc and funds for the VBS and Christmas programme). One boy stopped coming to the tuition. When asked why, he explained that his parents were very poor and they now had a new baby so the mother could not work and the father only had daily work. They made him go to work in a bag factory where he was only paid 50 rupees a day, 75 cents. Moloy paid for his fees at school on the promise that he would continue to attend the programme. He has very happy.